1 Blemished Available: $116.99 This item is available as a Blem/Refurb. These are items that cannot be sold as "New" merchandise and are limited to stock on hand. See the product details for a description of the product's condition. Touring on your motorcycle is not just for nice days. You have to be ready for all conditions. The Tour Master Solution 2.0 Boot has a long history of keeping you protected, dry, cool, and comfortable on the bike all day. Protection comes in the form of a molded nylon shin and ankle guards, thermoplastic heel cups and toe caps. The liner keeps your foot dry and cool no matter the conditions. Our preformed orthopedic insole combined with stretch panels in the boot help to keep you comfortable all day. Note: Solution 2.0 Boots are available in wide sizes indicated by a "W."
I have a wide foot and always wear a 13w or ee in all other shoes, these 13w fit my feet perfectly. Wide top is great for me as I can tuck my work pants in. Very comfy walking around. The YKK zipper feels tough and zips easily. These will be perfect for my rainy Coastal Oregon commute. I got these for a cross country road trip 6 years ago and they are still going strong. Are waterproof but haven't ridden in any monsoon conditions. A little hot but most WP boots are I figure. Comfort wise they are nice. Still holding up strong. This is my second pair; my first pair had a different, softer sole, but even after the sole was worn and dangerously slick, the uppers were still in great shape and waterproof. Now that they've updated the sole with a better pattern and material, these boots are even better and still a screaming bargain. Very comfy; I'm a slightly wide 12 and they fit perfectly. Obviously very plain, subdued styling, so you could wear these to work unnoticed most places. 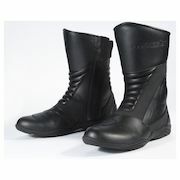 They have some protection features (like a stiff sole and ankle protection), but if you're looking for more of a battle tank boot with external armor, toe sliders, etc. look elsewhere. If you've never used riding boots before, the increase in comfort and control is eye-opening -- slim toe to get under the shifter easily, slim, somewhat smoother sole to make it easier to move around on the bike. No air flow -- they're a solid, waterproof boot -- but they don't get unduly hot on hot days. If you pull up your pant leg a bit, you can scoop in some air at the top. The leather, velcro and zipper on my old boots held up well and I expect these will too. Just a great value in a basic, no-nonsense waterproof boot. Highly recommended. When it was time to replace my old boots my search for new ones ended here. Easy on & off and comfortable to wear. It is quite hot during San Jose summer in these boots. In the office I always swap them for sneakers. Walking for a few miles in these gives you blisters. They stayed on my feet during a small highway accident. IIRC, they did not leak the first wet season. The next one, just a bit under 1 year of use (6000 miles or so), one of them sprung a leak. Then another one joined. Now, 19,000 miles later and a bit more than 2 years after I started using them, two sewn seams on left boot are broken and now I have to replace the boots for sure. Left boot is not quite eaten through but shows a lot of wear from the shifter. Amazing comfort and fit. Good looking well made boots. Appear to be very durable. Great protection and easy to walk in. Highly recommend. I wear a 12E in normal shoe (and can fit into a normal 12.) For these boots, I decided to buy the wide b/c I like to wear bulky socks or Gerbings in the winter. Even in the wide option, these boots are far too narrow. My foot barely fits in with a very thin riding sock. Super comfortable fairly light boot that I can wear all day riding or walking. Will most likely purchase again. Another good feature is the shift pad on the top is leather vs. plastic that eventually dries out, becomes brittle and falls apart. Issues include: 1. Zipper gets caught in storm or Gortex flap requiring additional fiddling to get it to zip up. 2. Sole is durable for normal use however if you have a kickstart lever, make sure there is a rubber around the end. My Norton did not and ended up punching a hole through the sole after 1/2 season of use. I'll just put a rubber on the bike if I get these boots again. 3. IF the zipper gets caught, it is likely to break trying to get unstuck, rendering mine to use a series of zip ties as a zipper pull. 4. Normal issues with Velcro wearing out and reducing its holding ability after a couple of seasons. It still holds the flap down but not as tight as when first purchased.